How far in advance do I need to make the Inca Trail reservation ? most trek permits were sold out 2 months in advance. In 2012, we therefore, recommend making a reservation at least 3 months in advance, although further time in advance is recommended. WHAT DO I NEED TO MAKE THE INCA TRAIL RESERVATIONS ? First, you need to e-mail us to: Click here, asking about Inca Trail availability dates after that. We will send you an e-mail confirming trek availability and confirming the total price of the trek & any additional services that you may have requested when you make a trek booking. Complete the form here. We require your passport number. We will use this number to purchase the trek permits. Your passport number will be clearly marked on the trek permit together with your name, as exactly as indicated in your valid passport, after that, you need to fill out in the Inca Trail reservation form with your personal information. WHAT ABOUT PAYMENT, DO YOU NEED A DEPOSIT ? After we have confirmed your trek booking, you will need to pay a trek deposit of US $ 150 per person. The deposit can be paid via PayPal, Bank Transfer or by Western Union Money Transfer. The remaining trek balance needs to be paid at our office in Cusco at least 2 days prior to the trek departure date. When we confirm your trek booking, we will send you the details about how to pay the trek deposit. CAN I TURN UP IN CUSCO THE DAY BEFORE TO PAY THE BALANCE ? No. We require everyone to be in Cusco at least 2 days prior to starting the trek, although 3 days is even better. Therefore, if your trek departs on a Monday, you must come to our office before 7:00pm. on Saturday to pay the trek balance. This ensures that everyone in the group is well acclimatized to the high altitudes. Unfortunately, this year we are no longer making any exceptions to this policy, even if our clients have already been at high altitudes prior to their arrival in Cusco. We are very strict on this point ! (please, note the trek balance needs to be paid in Cusco, and cannot be paid in advance on your arrival). IS THE TREK DIFFICULT, DO I NEED TO BE FIT ? 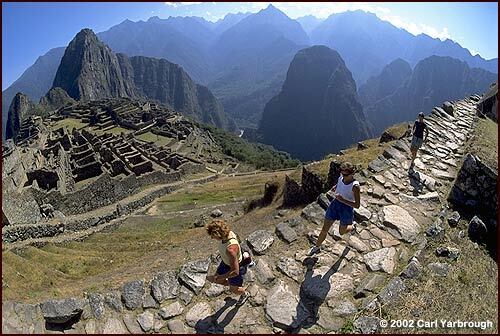 The Inca Trail to Machu Picchu is a 43 km. (26 mile) hike through mountainous regions. The maximum altitude reached is 4,200 m. above sea level. On the second day of the trek we climb 1,200m. Make no mistake, the Inca Trail is a fairly difficult trek and you should be well-prepared and healthy prior to starting it. You have to be moderately fit and take a regular exercise. Try walking 15 km in a day or go to the gym in the months leading up to the trek. It is also important to be well-acclimatized to the altitude. Try to spend 2 or 3 days in Cusco (3,400m) prior to starting the trek. This time can be very well used visiting the city of Cusco, nearby Inca buildings & the Sacred Valley of the Incas. The good news is that virtually everyone in the last few years who started the trek, finished it ! Only a handful had to turn back (see tips on "staying healthy on the trail" below). 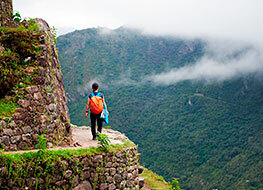 WHAT IS THE MINIMUM OR MAXIMUM AGE LIMIT FOR THE INCA TRAIL TREK ? There is no government restriction on the age limit for the Inca Trail. However, as a responsible trekking company "Qeros Tours Peru" Travel Agency & Tour Operator does not accept reservations for children under the age of 7 years old and adults over 67 years old. All persons under 18 years old must also be accompanied by an adult. We require that all of our trekkers over 59 years old hire the service of an extra third porter (6 kg, US $ 45). We recommend that if you are over 59 years old, you should talk to your doctor well in advance about how to plan best for the trek, and also to ensure that your travel insurance covers such adventure activities. We also insist that clients over 59 years old arrive in Cusco, at least 3 days prior to starting the trek (rather than the usual 2 days). For trekkers over 64 years old we also ask you to bring a letter from your doctor confirming that you are fit to participate in the trek. Unfortunately, if you fail to bring a letter from your doctor, we cannot allow you to start the trek and your trek deposit cannot be returned. WHAT DO I NEED TO CARRY ? Unless you hire an extra third porter, you will need to carry all of the above personal items. We include porters to carry all the other items such as tents, food and cooking equipment; Oxygen and First-aid kits. DO I NEED TO BRING WALKING SHOES ? Walking boots are recommended, as they provide support to the ankle which reduces the risk of injury, especially when trekking in the wet season (December - March). However, it is important that your shoes are comfortable and well worn-in and not brand new. We do not recommend trekking in sandals or using new shoes or hiring shoes prior to the trek. Make sure the shoes are sturdy enough for the duration of the trek. As far in advance as possible. The government has strictly limited the number of people permitted on the Inca Trail (permits are issued to about 500 trekkers per day, including the porters. 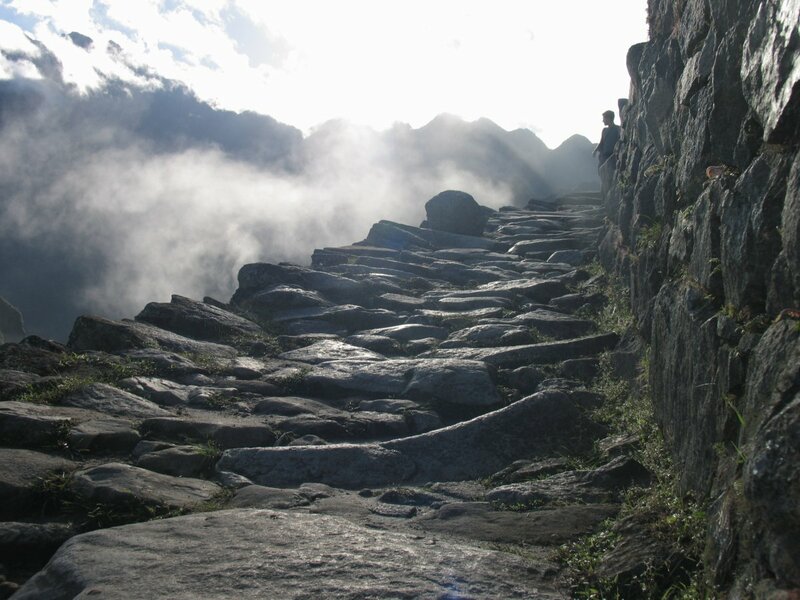 We therefore, recommend you to try to make your Inca Trail reservation as far in advance as possible. So, if you are sure about your trek departure date, send us an e-mail to: Click here. In 2010, most trek permits were sold out 2 months in advance. In 2014, we therefore, recommend making a reservation at least 3 months in advance, although further time in advance is recommended. June, July, Aug.: In 2014, most trek permits were sold out 4 months in advance. For 2015, we recommend making a trek booking between 4 or 5 months in advance. Earlier is a better time. 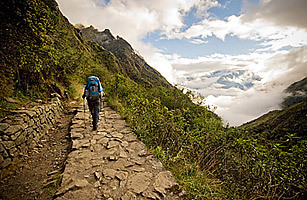 The Inca Trail is a 43 km (26 mile) hike through mountainous regions. The maximum altitude reached is 4,200m. above sea level. On the second day of the trek, we climb 1,200 m. Make no mistake, the Inca Trail is a fairly difficult trek and you should be well-prepared and healthy prior to starting it. You have to be moderately fit and make your regular exercises. Try walking 15 km. in a day or go to the gym in the months leading up to the trek. It is also important to be well-acclimatized to the altitudes. Try to spend 2 or 3 days in Cusco (3,400 m.) prior to starting the trek. This time can be very well used, visiting the city of Cusco, the nearby Inca buildings and the Sacred Valley of the Incas. The good news is that virtually everyone in the last few years who started the trek, finished it ! Only a handful had to turn back (see tips on "staying healthy on the trail" below). WHAT KIND OF SLEEPING BAGS DO I NEED TO RENT ? We recommend the use of sleeping bags at - 5ºC and -10ºC temperature tolerances, which are more suitable to stand this hike because you won't find temperatures as low as these on the Inca Trail, if you rent from our office. We will give you the sleeping bag (s) one day in advance. On the morning of the 4th day of the trek, the cook will have instructions for collecting our sleeping bag(s) from you and bring it/them back to our headquarters office. WHERE CAN I STORE THE BAGS THAT I DO NOT NEED TO TAKE ON THE INCA TRAIL? Any bags that you don't need to take on the Inca Trail can be left at your hotel in Cusco. Nearly all hotels have a luggage deposit and rarely charge for this service as long as you are returning to the hotel after the trek. You can also leave valuables in the hotel safe, but remember to bring your passport and some emergency money. We do not store clients luggage or valuables in our office. ARE THERE TOILETS ON THE INCA TRAIL ? Since the beginning of 2003-2004, many new camp toilets have been built along the Inca trail, including all of the major campsites. Each toilet has cold running water. Only the campsite at Wiñay Wayna has hot showers. Every evening we will provide you with warm water to wash with. HOW MANY PORTERS AND TREKKING STAFF ARE IN THE GROUP ? Q'eros Tours Peru Tour Operator is committed to look after our porters and our trekking weights are carefully calculated, so that our porters are not overloaded. The group sizes given below show the absolute minimum number of porters that we will provide for each group. As a professional company we will guarantee these numbers. Obviously, we will need extra porters, if any of our clients decide to hire the services of an extra third porter up until the maximum number of porters per group permitted by the government. DO QEROS TOURS CARE FOR THEIR PORTERS ? "Qeros Tours Peru" Travel Agency & Tour Operator guarantees that we pay our porters for the 4-day trek plus their transport costs. This is the legally required wage agreed with the Porters Union. Although ALL trekking companies SHOULD pay this wage, it is estimated that ONLY ABOUT 10 % of the companies actually do so (having talked to many porters on the Inca Trail, we know of only 7 other companies that are paying their porters the legal amount. We are enthusiastic supporters on porters rights. However, improving porter welfare is not just about paying fair wages. It is important that the porters have adequate food, a warm & dry place to sleep and to have access to the medical attention just the same way as any other member of the group). CAN I HIRE AN EXTRA PORTER ? If you hire the services of a third porter, you can give him a maximum of 7 kg (13 lbs) to carry, which is usually sufficient for your sleeping bag (about 2.5kg), mattress (1kg) and change of clothes (about 3kg). However, the porter will not walk at your side during the trek, so you will still need to bring a daypack to carry essential items such as water, snacks, camera, warm sweater and rain jacket. Hire an extra porter, your cost: US $ 42 but we need to know your confirmation to take an additional service of an extra porter at the time you make your booking. CAN I HIRE AN EXTRA PORTER ARRIVING TO CUSCO ? No. Because the restrictions on the number of people permitted on the Inca trail includes porters. Porters also have to pay a trek entrance fee (about US $ 14) and their tickets need to be booked in advance. If you want to hire the services of a third porter (max. 7 kg), then you must let us know at the time you make your trek booking. Unfortunately, if you feel weakened by the effects of the altitude when you arrive in Cusco and feel it necessary to hire a porter at the last minute, the new regulations make it impossible for us to arrange this, the guide can often help you find "unofficial porters" who live at Wayllabamba (first campsite), who can help you with your equipment, from Wayllabamba up to the top of the first pass (the most difficult section). These porters charge about US $15 for their services, but they cannot always be relied upon. Qeros Tours Peru & Tour Operator cannot accept responsability for the services provided by these unofficial porters. HOW IS THE WEATHER ON THE INCA TRAIL ? In general, during the day when the sun is out, you'll be too hot (imagine the beach), and during the early hours of the morning it can be freezing, so you have to be prepared for just about everything. It is recommended that you bring plenty of layers of clothing which you can take off as the day progresses. Trousers (pants) that zip off at knee level are ideal and T-shirts, long-sleeved Shirts and a warm Fleece are also recommended. May to August is the dry season, so you are unlikely to expect a lot of rain so, a simple lightweight plastic rain poncho is a good bet, although unlikely to be used, however during the wetter months you may want something more adequate such as a Goretex jacket or a thicker, more Heavy-Duty rain poncho. April to September temperatures at night can fall to freezing or below so, a four-season sleeping bag is highly recommended. It's compulsory to bring your original passport with you on the trek, with the same numbers you originally made your reservation with. Otherwise, you will be unable to go on the trek. Photocopies are not accepted. We will buy your Inca Trail trek permit using the names & passport numbers that you send us with your trek booking application. You must bring this same passport with you to Cusco and take them on the Inca Trail. If the name or numbers in your passport are different from the name & numbers on the trek permit, the government authorities will not allow you to start the trek and you will not be entitled for a refund. If you plan to renew your passport between the trek booking date and actually starting the trek, please read the section below about "Frequently Asked Questions" (FAQs) relating to passport numbers. If you make a trek booking at the student price, you must send us a copy of your ISIC card at the time you pay the trek deposit. If you fail to bring your ISIC card on the trek, the government authorities will not allow you to start the trek. You will not be given the opportunity to pay the extra difference in price and you will not be entitled for a refund. These are government regulations and apply to all Inca Trail tour operators.